Posted on 01/22/2018 by Marilyn F.
This Friendship Sampler was designed especially for the Lake Michigan Sampler Guild by Marsha Parker of The Scarlet Letter. It is an appropriate 20th Anniversary memento and a tribute to the friendships formed by and between our members. 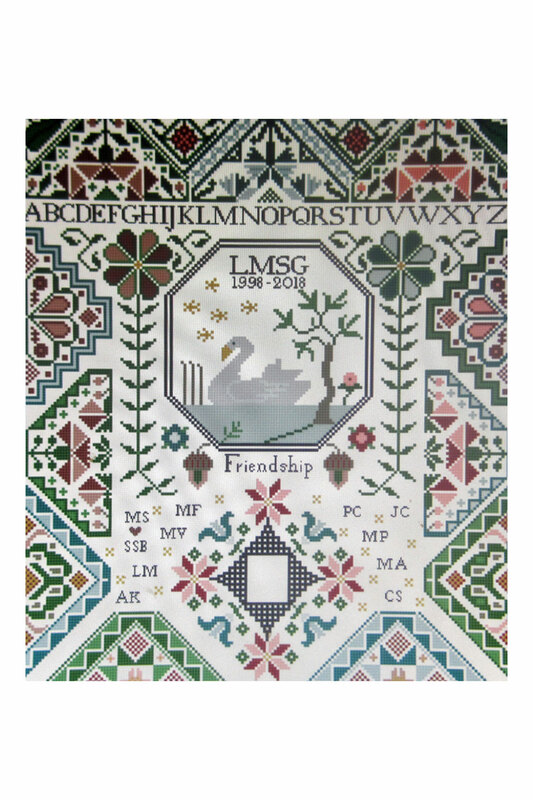 The swan on the medallion represents Lake Michigan and the initials stand for the many stitching friends that you have made through the Sampler Guild. The chart was distributed to members at the January meeting. Contact Mary Ann Anderson to request a chart if you were unable to attend the meeting. Click on the picture for a larger image.